A holster for your sidearm and one spare magazine. 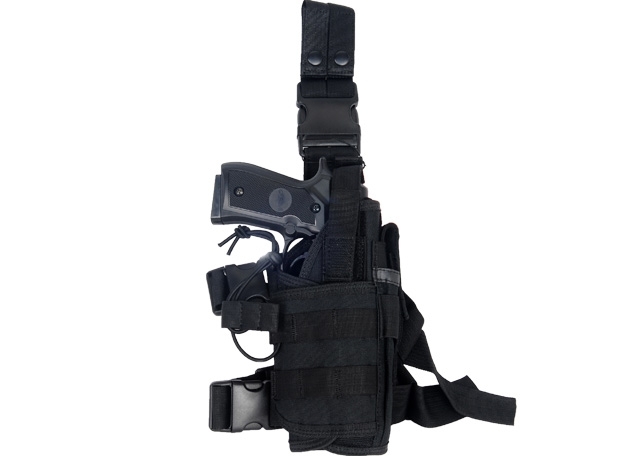 The Lancer Tactical "Tornado" Drop-Leg holster is a piece of gear you would be glad to have. 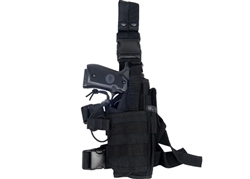 Named after the Velcro sections that wrap together like a vortex, this holster can be reconfigured to fit medium and large frame pistols, and even their attached accessories whether it be flashlights or lasers. Essentially able to be customized to your pistol's dimensions, and alongside its easy to use button and Velcro retention straps, you can depend on this holster to keep your sidearm safe and secure as you move around. The holster can be worn by attaching the belt loop from your waist and leg straps around your thigh and can be be fully adjusted to the user. Made from 600 denier polyester with rubber threaded sections, you can also depend on this holster to be safely secured to you too!